Language Log » Ask Language Log: "acrosst"
I am faced with a query from someone at a pretty high level at Public TV who is objecting to an employee's use of the preposition "acrosst". I looked for some dialect information about this variant of "across" but haven't been able to find it on language log, or anywhere else, without spending more time than I have, so I thought you might know of a post on the log, or know who might know whether this is regional, etc. 1759 in Essex Inst. Hist. Coll. (1882) XIX. 145 Ye enemy fird at our men a Crost ye River. 1779 W. MCKENDRY Jrnl. 6 Sept. in Proc. Mass. Hist. Soc. (1886) II. 467 The Lake..is..about 8 miles acrost. I'm in Europe and so don't have access to my paper files in Athens [GA], where I could address the particular findings on this point. The "st" ending is known, especially in Ireland, to be applied to "while" yielding "whilst", and some usage mavens don't like it. A similar case that I know about is the choice between "toward" and "towards", as when you "turn toward(s) an event." I wrote about our Atlas evidence on that one for a Bill Safire "On Language" column years ago (it turns out that the Mid-Atlantic speakers who don't like "towards" are the only ones not to prefer the final s!). In Michigan, people who work for the Ford Motor Company often say that they work for "Fords," which might be interpreted as a strange genitive construction but probably isn't. So, the presence of an extra -s or -st is a commonly occurring variant pronunciation in English. No need to get excited about it. It is not substandard, just a bit different, like many other variations that naturally occur in the language of every educated person. If somebody with enough authority at MPTV doesn't like it, then she can ask the employee not to do it. Now, if somebody then asked me to find such variations in the speech of the MPTV honcho, I suspect it would be easy to find them…. We've all got them. Might be better not to start down the road of correcting every little thing we hear. Back in Athens last night. I've had a look at the paper records, and can tell you that we recorded the -st form of "across" from about 20% of the people we interviewed in Maryland (11/62). The form is found throughout the state, from Eastern Shore to Baltimore to up north near the panhandle. It's used by both men and women, both middle age and older (we didn't interview too many young people), different job types. I did not see it among the most educated, but did find it regularly among high-school educated people. It is also pretty common in Pennsylvania, less so in Virginia. Kurath and McDavid produce a map (#179) in their *Pronunciation of English in the Atlantic States* of the places that add a -t to the words "once" and "twice" which shows that the pronunciation is widespread in the Midland and South (except the Virginia piedmont), and "widely used by middle-class speakers" in these areas besides by less-educated people. So, what they say about "oncet" and "twicet" matches what we found for "acrosst". So, the evidence says that this is a historical pronunciation in Maryland and adjoining states, not particularly marked as uneducated. Our interviews are 20th. c., so not contemporary, but these things usually don't disappear. And also Ring Lardner's You Know Me Al, which has dozens of instances of acrost, e.g. Well Al I and Schaefer was talking to gether and he says Well may be this is the last time we will ever see the good old US and I says What do you mean and he say People that gos acrost the pacific Ocean most generally all ways has there ship recked and then they is not no more never heard from them. 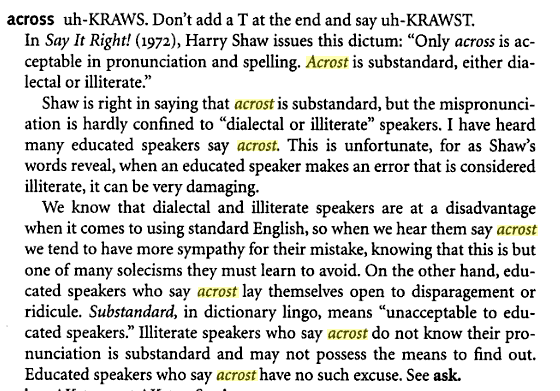 The fact that Elster feels the need to warn "educated speakers" in such dire terms ("lay themselves open to disparagement or ridicule") is good evidence for Bill's suggestion that acrost is "not particularly marked as uneducated", at least in certain regions. On the other hand, Elster's discussion also makes it clear that Janet's Public TV friend is not responding in an idiosyncratic way. I'm from (and in) Michigan, and I hear us making possessives of corporate names, particularly stores, not just adding an s. I cannot recall hearing folks who work for "Ford's" as opposed to "Ford," but I frequently hear people shopping at "Meijer's," "Kroger's," etc. Granted, I may be misunderstanding other speakers' intent (my own private greengrocer's apostrophe? ), and I am not currently able to search through text, but I recall many instances of seeing them written that way locally. It perhaps does not help that stores uses possessives in their name seemingly at random, nor that you can find "Meyers" retail outlets a stone's throw from "Meijer." I (expect to) hear possessives more often the store's name sounds like it could be someone's name, so "Farmer Jack's" more commonly than "K-Mart's." Regarding toward(s) (and forward(s), backward(s), etc), I was taught that the s form is standard in the UK, while the non-s form is standard in the US and that one should never use the UK version in the US and vice versa. I've come across whilst before (though I don't use it). The other words discussed sound bizarre to me. I'm sure I've never heard them. I find Mr. Kretzschmar's comments about a general "-st" ending to be interesting and surprising, because my initial guess was that "acrosst" came about by conflating "across" and "crossed". I live in the Manitoba, and I'm familiar with "whilst" (which sounds archaic to me) and "toward"/"towards" (I honestly can't think of any distinction between the two – they feel synonymous and equally acceptable to me). The others mentioned ("oncet", "twicet", "accrost", "Fords") all sound really odd (dare I say "wrong"?) to me, though. Qualitatively, they sound like something that would crop up in the speech of my western relatives (who use constructions like "youse guys" and "heighth" that are unusual for this area but more common in the region of Saskatchewan that they hail from. Overgeneralizing the archaic -st suffix seems plausible. Has anyone else noticed this with the -dth suffix as well? I have noticed in one of the TLC shows about little people, where they seem to often refer to non-little people as "average heigdth", as far as I can hear. As in width, depth, breadth, and "heigdth". Not sure if it's dialectal. This pronunciation is absolutely ubiquitous today in southeastern Pennsylvania, southern New Jersey, Delaware, and the parts of Maryland surrounding the Chesapeake Bay (on both shores). The commenter above mentions "youse guys," which is also commonplace, though only in the most northern parts of Maryland (Harford County) and Delaware (New Castle County), and southeastern Pennsylvania and New Jersey. "Youse guys" disappears below the Chesapeake and Delaware Canal. You won't hear college-educated people use any of these forms, but a good portion of others do. Long, long ago (about 1995, if memory serves), I answered a question on alt.usage.english about toward(s) and beside(s) that eventually wound up on my web site. For what it's worth in this context, it can be seen here. My parents (and their siblings and some offspring) all say "acrosst" for "across". They grew up, as did their parents, in the Niagara region of Canada, except for a few years my paternal grandfather spent in Saskatchewan as a young man. I've always though of it as a "contraction" between "across" and "the", as in "acrosst the street", as it seems to be more pronounced when followed by a "t" sound. Oddly enough, I've never noticed it in anyone else living in the area, and always just figured it was a family thing! I most definitely say "acrosst." It's probably one of the more consistent deviations from a pure "highly-educated standard" AmE in my idiolect. I don't have oncet, or twicet, or whilst, or heighth, or any of the other suggested analogs, though. ("Toward(s)" and "beside(s)" feel a bit different to me, and anyway as to those two I now seem to have gotten stuck with that odd self-consciousness that blocks accurate self-reporting of usage). FWIW, I grew up next to Maryland (in northern Delaware), but my parents weren't themselves native to the area and the impact of any non-standard and/or low-prestige regional substratum in my own speech seems rather variable. I can't actually recall anyone peeving at me, or correcting me to my face on the "acrosst" issue, and . . . I've frankly never worried if people are secretly holding it against me. Zubon, speaking of ways of referring to your grocery store, in Northern Illinois we always say we're going to "the Jewel" or "the Dominick's." I think it's just grocery stores that get an article. I never say "the Target" or "the Kohls". I wonder if there's something about grocery stores that receive special treatment from speakers. "Whilst", "towards" and "Ford's" are in common usage in the UK. Around NYC, I would associate "acrost", with or without an extra "s", with speakers who also use "aksed" for "asked". We have a small percentage of "acrosst"-sayers in Minnesota, though I haven't noticed any corollary traits (income, being from out of state, etc.). "Heidth," however is rampant, even to the point where I sometimes feel self-conscious saying "height" in the more standard pronunciation. Here in Chicagoland we have Dominick's and Jewel, but my family and friends and I all refer to the latter as "Jewel's" (and I have said "Meijer's" when I was in Michigan). I always thought it was pure parallelism (hence the interpretation as a genitive), but perhaps it's more widespread than I thought. In New Zealand, 'whilst' and 'amongst' are quite common. and to try to mesh w/ Joy's observations, while I grew up decidedly "above the Canal" in Delaware, I most definitely don't have "youse guys" and I don't recall it being all that common in my peer group growing up. But I went away to college way back in '83, never moved back as an adult, and things may have changed. I just find it striking that I have "acrosst" in my idiolect so strongly w/o it seeming to be part of a larger suite or set of regionally common non-standard usages. I think I probably do have some wacky Delaware Valley dipthong things happening in some of my vowels when I'm speaking informally, but that comes and goes to some extent, whereas the -t in acrosst is pretty stable and I don't think I lose it even when speaking in a formal context. Half of my high-school math teachers — in suburban Chicago in the early '90s — said "acrosst." It used to drive me crazy. I would have guessed this was a hypercorrection for word final -t deletion, which is highly favored following a sibilant like -s, maybe more likely to occur because it's commonly next to "the", as in "across the street". In fact, in most people's speech "acrost the street" and "across the street" would be indistinguishable. Are you really saying that "beside" and "besides" are ever interchangeable? I find them completely distinct. In the spacial sense, it's always "beside". In the "other than" or "in addition" it's always "besides". Compare "there's nothing besides this table in the room" to "there's nothing beside this table in the room". Yes, the spatial sense is alway without 's', as I said. But the metaphoric 'other than' sense may be either one, though the variant with 's' is possibly more frequent in my speech (which is what I was reporting on) than the one without. My family is from rural southwest Washington state, between Vancouver and Mt. St. Helens. 'Towards', 'acrost', and 'heigth' are all common there, but not 'oncet' or 'whilst'. I was working as a proofreader at an ad agency. One time a piece I had proofed was sent to a client for review, and when it came back, the client had made a snippy note asking us to please correct "height" to read "heighth" (as it had been in their original copy). I don't generally get too worked up about being miscorrected, but that instance stands out in my memory for some reason. Many of the stores in my home are referred to with the added s, which I always assumed to be a genitive, such as "Ford's" (a local jewelry store), or Belk's or Kroger's. I think it's used, or was used, for businesses with a person's name, or a name that was assumed to be a person's name, but never for a business that didn't have a person's name. Never, for example, Rome's, for Rome (Ga) Seed and Feed. Here's a vote for encouraging all these archaic variant usages. It warms my cockles when I hear any of them, "heightth", "whiles", "whilst", "oncet", "acrost", what-have-you. There's no better place to encourage these usages than on public radio. I hear entirely too much spelling-pronunciation of "often" these days. Is that really on the increase, as it seems to me? I think Mark P and I hale from the same general part of the country. Around here we say Kroger's, Wal-mart's, and so forth, though many understand that such naming is more or less incorrect (but note that many stores, e.g., Macy's, are archetypes of this usage). I friend here says oncet (I like the spelling onest better), but never says twicet or acrost. Another friend from Indiana says alls, as in "Alls I know is that he said he'd be here at 8." I always considered this a contraction for "all as" meaning "all that". Who else knows of this form? How many clergymen do you know who pronounce the t in "epistle"? I've heard of one only. "Heighth" /hait/ seems to me a reasonable regularisation, making the word parallel with depth, width, breadth, length. Has anyone looked in detail at phonological conditioning for "acrosst" vs. "across" (in the speech of speakers who use both)? My wife had a co-worker who, to her recollection, primarily used the "acrosst" pronunciation before a vowel-initial word. A lot of shops or restaurants whose names aren't genitives get genitivized when it wouldn't result in an unreasonable name. Both my parents have done this (West Coast); people I know around from around here (Boston) do this; my ex (born in Germany, high school in B.C., university in Southern England, M.A. in Toronto, now doing a PhD in Boston). I always assumed that the speakers simply thought that the name of the establishment was something other than what it was, but the people who work at Ford presumably know that it's the Ford Motor Company rather than the Fords Motor Company, so maybe this is something other than a simple error. I've definitely heard "Alls I know is" in southwestern British Columbia growing up, and suspect it is common in other regions as well. Someone once tried to convince me that "worst" did not exist — that the superlative of "bad" was the same as the comparative. I suppose he was overcorrecting as a result of being badgered about "acrost" & the like. Not only "towards" but also "backwards", as in "Bass Ackwards". Just to throw another datapoint out there. I use "acrosst" regularly, as well as "towards" and other direction variants. I occasionally alternate and it feels like there's a semantic distinction for facing vs motion (which also applies to my reading of "beside/s"), though I get the feeling that wouldn't be borne out in study. "Whilst" is fine, though nicely archaic, but I've never heard of "oncet" or "twicet" before. I grew up on the Maryland side of DC, and my folks just moved there from Kansas. The only person who's ever corrected or commented on my "acrosst" is my findanzata, who was raised in the same area of Maryland, father from NYC, grandparents from Italy; mother from Louisiana. The genitives for store names is also very common in Portland (not sure about the rest of Oregon). I spent a decade there and thoroughly adopted the dialect, though my "acrosst" et al. was from before then. It's regularly used for name-like store names, though it's sometimes used for non-name stores as well. I've always interpreted the genitive in a similar way to the 屋 (ya, lit. shop, seller) suffix in Japanese. I used to be uncertain as to whether the restaurant chain called itself Friendly or Friendly's. It turns out that they officially added the 's in 1988, in some sense. But judging by their website the company may still be the Friendly Ice Cream Corporation, even if "Friendly's" is printed all over the menus and the signage. Mr. Fnortner: "Alls I know is that he said he'd be here at 8." I hear the construction as an odd kind of is-contraction: "All's I know is that…" is short for something like "All[ that it i]s [that] I know is that…"
[(myl) People that I know who use this construction — including me, sometimes — also can substitute as for that in things like "I don't know as I agree" and "Them as has, gets". So the most likely explanation for "All's I know" is that it's a contracted form of "All as I know". But there are apparently others for whom it's an isolated and frozen idiom, without any broader support. I prefer toward to towards, which is helpful because AP style also prefers toward. AP also goes with upward instead of upwards. That is usually okay with me, but not when someone is talking about "earning upwards of," which I tend to class as idiomatic. I always want to correct it when I see "earning upward of." Searching both terms in Google yields a noticeable difference in the number of results — over 3 million for upwards compared to about 16,000 for upward (although Google counts don't seem to be as reliable as they used to be). I associate acrost with other pronunciations such as "ast" for ask and also the use of "busted" for broken. Regarding Ford's for Ford Motor Co. in Michigan, could the form have come from workers at the original plant, where people worked at Henry Ford's plant, not the Ford Motor Co.? Would newspapers show evidence of this — a story about an "accident at Mr. Ford's" plant or factory or whatever and then later stories or obituaries referring to "Ford's"? I'd never heard "acrosst" growing up on the West Coast, but I hear it all the time in Colorado (along with dropping "to be", e.g. "this needs done" or "the cat wants petted") from people who grew up here. I don't see acros(s)t in text, though. I've seen almost every other variant mentioned here except "acrosst." That's completely new to me. Born and raised outside NYC but spent a number of years in Baltimore, where I learned to say Bawlmer and incorporated "hun" into my vocabulary. I'm an Australian. I personally use towards, upwards, etc. but would not consider the other forms of these words marked. I would consider acrosst, oncet and heighth marked (but do not recall having come across them). When my siblings and I were little, my parents took us to a gym. They were a bit confused at us referring to it as "Jim's place" until they found out the owner was named Jim. I guess we figured it was called a gym because Jim owned it. @Joy, growing up in New Castle County, Delaware, I never heard "youse guys" inside the twelve-mile circle. If anything, I would have considered it a lower-class Philadelphia marker. I agree, however, that "acrost" is ubiquitous in the area and was the pronunciation I learned as a child. I don't really agree with Bill Kretzschmar's claim that "whilst" is especially common in Ireland. It exists here, but no more so than in Britain, just as with "amongst" and "amidst". Style Guide for British English usually prefer the forms without -st. However "unbeknownst" appears to reverse the trend by being more common in the US than the UK, and Ireland may pattern with the US in that. Addition of -st also occurs in Irish: arís "again" has a variant aríst. The form "heighth" is common in Ireland, part of a general hypercorrection of TH for T, also found in spelling pronunciations of "thyme", "Thailand", etc. There was a short discussion over whether "while" and "whilst" had different meanings in The Times's Reader's Editor column only last Saturday, with a peevologist writing in to congratulate a rare correspondent for using "whilst" to mean 'at the same time' instead of using "while" (which she said meant 'over a period of time'); but another correspondent and the The Times editor disagreed, saying there was no difference (and The Times style guide recommends avoiding "whilst" as being archaic). This is all behind their new paywall. "I think I'll go to Americal this summer." They also say things such as "Where's it to?" instead of "Where is it? ", all of which apparently makes outsiders think of Bristol as a city of farmers rather than potential TV executives. Personally I rather like that, but then I'm used to it – however, I find "heighth" grating, even though it is logical enough having it match depth, width etc, as others have mentioned. Adverbs ending in -s include those ending "-wards" and "-ways", and "perhaps", "thereabouts", "unawares"; and more nonstandard, archaic, or specialised words like "somewheres", "upsides", "widdershins", "betimes", "amidships", "belowdecks". One might add "nowadays","upstairs", "outdoors", "overseas"; and "certes". This discussion reminds of dropping the "a" in across, as in, "He's from way 'cross Georgia." I don't know in how many usages the "a" is dropped, nor how common the joke is any more. Whilst, against, amongst, and amidst developed from earlier whiles, againes, amonges, and a-middes, which were all genitives. Betwixt similarly developed from earlier betwixe. "I am sorry for your lost" has been cropping up recently. (Google it.) And I saw "Our lost is your gain" in a Chinese discount shop in downtown NYC a month ago. I don't know if that's related. For the record: this Charles Harrington Elster seems to be a hideous, beastly, nasty piece of noisy air, and he should be put to death with doom-doom bullets thus pronounced. Given the other clues to the accent in the poem, I would pronounce that 'crawst'. @Peter, you caused me to remember a childhood moment. The neighbor kids, ages two to seven, were excited about a vacation the family was taking to "my mother's Ami." After some puzzlement and a little questioning, I learned that she was taking them to Miami, where she was from and where she frequently traveled. @Mark P, that could be Waycross. As adjectives, "-wards" words seem only to be "-ward" words, e.g., backward movement, forward thinking, rearward flight, and so forth. To me, this reinforces the distinction between "to" and "at" suggested in Lawler's piece. I would also like to vote for some more info on this "strange genitive construction, but probably isn't." Here in Seattle, old-timers will refer to the airplane manufacturing company as "Boeings". And, of course, we're home to Nordstrom, nearly universally referred to as "Nordstrom's". Plus the many others noted elsewhere, including my childhood favorite, Montgomery Ward[s]. I guess I'm curious about why "Fords" and "Boeings" are dismissed as genitive constructions. What else might they be? @Mr Fnortner – My father's (probably apocryphal) WW II basic training story is that the sergeant asks the recruit where he's from. Recruit answers "Waycross, Georgia." Sergeant says, 'I didn't ask what direction, I asked what town!" "Waycrosss, Georgia!" Who's on first? And so on. How about 'sangwich' (sandwich), 'punkin' (pumpkin), 'i-scream' (ice cream), 'eye-talian' (Italian)? Are these sloppy pronunciations, dialect, or something else again? I'm with Barbara Phillips Long on both points. I was taught in school, at some point, that "toward" (etc.) should be used for physical direction ("toward the exit), and "towards" (etc.) in figurative applications ("towards a more fair society") — and I'd certainly say or write "upwards of". For companies, I associate the added "s" with family names, like Ford. Does anyone say "GMs"? That's how our grocery stores are named in the Boston area — Shaw's and DeMoula's, but Star and Stop & Shop. The -ward/-wards distinction isn't quite as neat as adjective/adverb. Even in Britain, people say "forward" much more than "forwards" (except in "backwards and forwards"), while OTOH "look forward to" is far more common than "look forwards to". The physical/metaphorical distinction was made in the OED but disputed by Fowler. Like the similar farther/further distinction, it's a statement of tendency; you can make it a personal rule if you like but don't bother trying to impose it on others. My preference for "a backwards glance" over "a backward glance" preserves the physical/metaphorical distinction at the expense of the adjective/adverb distinction. But my preference is not the result of any conscious weighing of such putative rules; rather, the rules are attempts to find patterns in people's pre-existing preferences. Most of my British co-workers (mostly Durham-area) use "whilst" regularly, possibly exclusively (though conditional memory might prevent me from noticing their "whiles", since it wouldn't be unexpected). I read something that suggested that it was a second-half 20C drift in BrE, a deliberate revival of the more archaic variant. For the geographically frustrated, Waycross, Georgia, is located in the extreme south southeast of Georgia, just at the upper edge of the Okefenokee National Wildlife Refuge (swamp). It's way across Georgia from almost anywhere in the state, but I doubt that's where the name came from. However Plum Nelly, which occupies the NW corner of Georgia gets it name (they say) from being "plum" out of Georgia and "nelly" into Tennessee. Sorry, with all the Ss and Ts filling up the comments here, I just thought I'd throw that in. ..bruce.. Since moving from England UK to Georgia USA six years ago I haven't heard "acrost", but I have noticed the common use of "heighth", which at first took me aback a bit because I don't think I'd ever heard it in England and it seemed so obviously an error. I assumed that it was a kind of spoken spelling mistake (depth, width, length, etcetera, all ending with "th"), the "t" and "h" simply being swapped. But… I haven't yet heard "weighth"; I'd expect to have heard it at least once since height and weight so often go together. Just another geographical data point: my family from York county, PA (near Harrisburg) very often say "acrost", and my grandmother born and raised there there usually says "onest" as well. For example there is an "intrusive t" in "onest or twice". But they don't say "whilst". @Craig – Agreed! I have always theorized that "youse guys" crept in from the Philadelphia surrounds–Chester, Ridley Park, Claymont (Del. )–I grew up "below the canal" in Delaware and it always seemed to me that the people using "youse" (as the second-person plural) came from that area. (As you know, we're now talking about a very limited part of the state.) As people have migrated to the less populated parts of the state, they brought this usage with them. You hear it fairly frequently now in Kent County, and occasionally in Sussex. Several co-workers over the years have looked at me, when alone, and said, "Are you going to the store?" If I happen to be standing there with my keys in my hand and another person with me, they say, "Are youse going the store?" I grew up in the rural Midwest, and I often heard a long period without rain referred to as a droughth. @uan Muir: Milton wrote "That to the highth of this great Argument," usually "corrected" by modern editors. O.E. hiehþu, Anglian hehþo "highest part or point, summit," from root of heah "high" + -itha Gmc. abstract noun suffix (cf. O.N. hæð, O.H.G. hohida, Goth. hauhiþa "height"). The modern pronunciation with -t not established till 18c., and heighth is still colloquial. O.E. gewiht, from P.Gmc. *(ga)wekhtiz, *(ga)wekhtjan (cf. O.N. vætt, O.Fris. wicht, M.Du. gewicht, Ger. Gewicht), from *weg- (see weigh). The verb meaning "to load with weight" is attested from 1747; sense in statistics is recorded from 1901. To lose weight "get thinner" is recorded from 1961. Weight Watcher as a trademark name dates from 1960. To pull one's weight (1921) is from rowing. So "height" was originally pronounced with the "th" ending, whereas "weight" was not. I don't know what happened to "Duncan" there. Our posts crossed, but in agreement. And why did I call you "Rodger Post"? I'll stop now. @Rodger C: Milton wrote "That to the highth of this great Argument," usually "corrected" by modern editors. How often is "usually"? It's "highth" in the editions of Alastair Fowler (Longman) and Helen Darbishire (Oxford), and in Christopher Ricks's edition of the Oxford Book of English Verse. @Don – my father, who grew up and spent most of his life in NW Georgia, pronounced it droughth. I do not hear that pronunciation any more. @Xmun: I have no statistical evidence for "usually." I should perhaps have specified textbook editors, to say nothing of editors of essays where the line is quoted. I just got 10,000+ Google hits for "highth of this great Argument" and 55,000+ for "height …". At about age 11 I began to notice "acrosst" and "akst" in the speech of children transferring into my small-town elementary school. Don't know where I'd picked up awareness of these as social class markers, but I definitely remember looking down on people who spoke this way — the same ones who used the contraction "don't" as a third-person singular construction, as, "He don't like that." Don't know where I acquired this snobbish attitude, either, maybe from one or more of my instructors in English in fourth or fifth grade. Should note here, I guess, that English is my native language, and, further, that these particular patterns were absent from the speech of my parents. Some of these new classmates in the years 1936-1940 were the children of oil-field workers who arrived from East Texas when exploratory drilling began in coastal South Texas in the 1930s, and some were the children of farmers and ranchers, who transferred in when a consolidated school district was implemented. I don't think my class-consciousness was acquired from my parents — if it was, it was induced very subtly and not overtly taught. I think that these particular speech patterns must have arrived in Texas with the first settlers from Tennessee, Georgia, Alabama, and even from Missouri, in the 1830s, 1840s, and on into the 20th century. It was interesting to me to see them so strongly identified with Pennsylvania, Maryland, and New Jersey in some of the comments posted here. About the definite article with store names — there's what looks like an arbitrary mix in my own speech. I say, "I'm going to the grocery," but, "I'm going to Kroger's" — and I add that "s," as so many in this discussion have reported they do. *But* here's an interesting exception: I used to say, before competition closed many of its retail grocery outlets in the Southeast, "I'm going to the A&P." The first time I said this to a rural Kentucky schoolteacher with whom I was carpooling, she teased me by replying, "We could run by your house and let you do that first." I consider acrost (and a contraction, 'crost) as part of an archaic variant of English. That is, I've heard them a lot, but always from people who also use other forms that haven't been popular for about three and a half centuries. @Joy: "You won't hear college-educated people use any of these forms, but a good portion of others do." Really? My life-long-Delawarean husband with a master's degree says acrosst. He doesn't write it that way, that's just how he says it. The stuff coming out of the faucet, he calls wudder. But he spells it water. Not every regionalism equates to lack of education. Even surgeons from Georgia have southern accents. A search of Google Books yields hundreds of examples of acrost, at least once in educated18th or early 19th century written usage (The Public Papers of George Clinton, First Governor of New York), but most in dialect, from The Yearling to You Know Me, Al. In Huckleberry Finn, Jim uses it three times, and both Kipling and Jack London put it into the mouths of Irish characters. Everywhere I've spent much time in America, "heighth" and "heightth" (together) have seemed almost as common as "I need to lay down for a while". @Don and Mark P.: You'll find "drouth" in dictionaries. I too wonder why Bill Kretzschmar thought I work at Ford's couldn't be genitive. I'd have guessed that even B. K.'s for Burger King was inspired by genitives such as Mickey D.'s. Sorry, Bill Kretzschmar said Fords "probably isn't" genitive. "The A&P" was common due to the origin of the name: The Great Atlantic and Pacific Tea Company. The only similar example I can think of is The Bay, the common name for the Canadian department store chain run by The Hudson's Bay Company. Insurance companies and banks used to take "the," as in The Hartford, The Prudential, The DIme. Nowadays it's Travelers, not The Travelers. Most retailers are named for the original owner or owning family, thus the 's is an attribution of ownership, even where the formal name doesn't have the possessive. The name above the door is Tiffany, but the movie is Breakfast at Tiffany's. Where the name is not a family name, there's no 's. Kroger's and Wegman's and Albertson's, but Giant and Food Lion and Safeway. "Whilst" is bog-standard in UK business English to mean "although." Perhaps there's a difference between "while" meaning during and "whilst" meaning although? My knowledge of UK usage isn't good enough to know. UK usage makes genetives out of law firm names. Three very large firms, founded by men named Linklater, Lovell, and Freshfield, are known as Linklaters, Lovells, and Freshfields. And why wouldn't Fords be genetive? The company has always been identified with the family, and Henry Ford or a descendant was president until 1979. In general I would agree that only businesses bearing someone's name get the genitive form, but until a few years ago, Californians shopped at "Lucky's." "Monkey Ward's" was known nationwide. The Ward's catalog actually said "Montgomery Ward & Co.," if I remember correctly. I think the usage is dying out, if only because fewer businesses have the proprietor's name on the door. I believe I grew up saying "acrosst," "heighth," "towards," and third-person "don't," although I don't think I say any of them now. I can't say I've ever heard "oncet" or "twicet." Our Oklahoma-accented neighbors said "aks," but we didn't. In my observation, a few years of college does little to change one's native accent, although your accent will determine how educated people think you are. Montgomery Ward was named for its founder, a man named Montgomery Ward. Hence "Ward's." Lucky is an interesting counter-example. I wonder if the name was subconsciously perceived as a person's nickname.
" …your accent will determine how educated people think you are." I think that's true. The "Southern" accent is almost universally used in Hollywood as shorthand for "dangerous, ignorant redneck", especially when it's a sheriff. Mollymooly: Whilst is "common in Ireland" in the sense that it occurs there at all, unlike North America where it is an archaism or a conscious Briticism. Nicholas Waller: The most notable Bristolism with final /l/ is the name Bristol itself, which as far as its etymology is concerned should be spelled Bridgestow(e). Mark P: Some accents are stigmatized, some accents have speakers who "identify with the oppressor" and stigmatize their own accent. But some accents, like the Northern Cities one, are totally invisible to their own speakers! @Nicholas Waller: "Ideal" for "idea" is common in the American South, but I don't know whether its a West Countryism or simple confusion. In my part of the American South I have heard "i-dee" (not so much now) and "idear" for idea. The "i-dee" pronunciation was sometimes more like "idy" with along i.
bloix-Yes, I thought I said that. If I didn't, it's what I meant to say. I assume that "Monkey" is a variation of "Montg'y" Most people over a certain age have parents who called it "Monkey." And I've wondered about Lucky's. Perhaps you're right and we all saw it as a personal nickname. People even wrote checks with the possessive form. @Julie and Bloix: Along with Lucky's, of course, we in California have the supermarket chain Ralphs. I learned not long ago, to my surprise, that it was named after someone named Ralphs – that's why it's not "Ralph's". But in confirming that story just now, I see that it was named after two brothers named Ralphs. So technically, it might have been "Ralphses"! Then there's the sandwich chain, Brads', founded by two friends named Brad. Just going through my own anecdata for some major English supermarket chains: Sainsbury's, Morrisons, and Asda are pretty much always referred to by their formal names. But Tesco, Safeway, Aldi, and Marks and Spencer often get an 's added (which I'd guess most innocent speakers think of as a possessive). (Unwitting) examples of these can be seen even in eg the relevant Wikipedia articles. I lived in San Diego for 11 years and heard everyone, of every education level, saying 'acrosst' though they would write it 'across.' Being from Connecticut, I had not heard it previously so chalked it up to a California thing. Now I live in Colorado, and still hear the ubiquitous 'acrosst.' When I correct people (I know — totallly annoying! ), they insist that they are saying the word correctly. I'm convinced that this word will eventually evolve into 'acrosst' over time, since it seems the majority of people prefer to pronounce it that way. Sounds so foreign to my ears… but everyone around me seems to think it's normal. Putting some of the pieces together– since "acrosst" has been attributed to Ireland, and is reported a lot from Maryland, it makes sense since Maryland is where all the Catholic immigrants went in colonial times. I wanted to check if this formed any part of an Appalachian dialect, since after the Revolution a stream of Irish Catholics from Maryland emigrated west across the Alleghenies, but haven't found anything; all the reports are from the Chesapeake Bay or Delaware estuary tidewater. No idea how it got to Texas. Sheryl Crow sang "Watch out sister, watch out brother, watch our children while they kill each other with a gun they bought at Wal-Mart's discount store." Clearly a genitive, and the possessed is "store." Perhaps "store" is the implicit possessed in those other genitive constructions. Growing up in Chicago, I never heard anyone add a "t" ending to "across". In the last 20 years, however, it's quite common to hear people pronounce it with a "t" ending. This is done even by people who did not grow up pronouncing it that way, even my 85 year-old mother. If I point it out to someone, he or she usually seems unaware that he or she pronounced it that way, even though they continue to write it correctly. When I first heard it as an adult, it was primarily African-Americans who used that pronunciation. Now, it is widespread among persons of all races and levels of education. My theories about this are either it's somewhat easier to pronounce with a "t" ending or it's just a matter of a "less-schooled" pronunciation that spread upward through the culture as people became less "picky" and formal about their everyday speech.